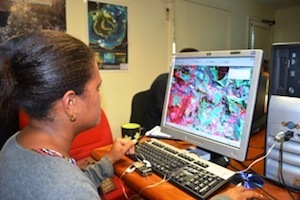 The Ocean and Islands Programme made an investment in 2007 into a more strategic approach to data management and, in late 2008, the OIP Geonetwork system became operational and available for public viewing and use. Geonetwork has hugely improved the Programme’s data and product visibility, as well as its ability to collate, protect and provide access to its historical and newly collected data and analysis products. The work to continue population of the system and response to increasing volumes of requests grows yearly and it is important to note this strategic response to a web-based data discovery and archiving system is demand (not supply) driven, as evidenced by use statistics. During the 2012 reporting period, Geonetwork content increased 20 per cent from 7,010 items to 8,387 entries, covering products from the entire membership. Bathymetric data entries in particular increased and about half of this year’s written requests were for bathymetry data. Otherwise, the system recorded 407 data set downloads from open records in 2012 (a 295 per cent increase over 2011's total), and 46 written requests for protected data (a 21 per cent increase over 2011's total of 38).